THE MUSE IS DEAD. LONG LIVE THE MUSE. If you're locked out from your own creativity, here’s 7 keys to help open the door.. Nothing is ever really simple. Just getting started can be a real challenge. So how do creative people begin to create? Do their ideas just arrive? And how do they arrive? Is there a recipe, a process? Can we fast track creativity? How do we open that door? The Door is a metaphor in this case of course. Coming up with an original idea or intuitive start to a painting, drawing or design can be a frustrating, daunting task for many, and everyone wants to know the best way to unlock the mind and explore within. Most of the time I can find a key, an entry point.. but there are also times when I have to try and prise the door open with the help of other means. Then there are the times I have found the door wide open and I simply need to pick up the pencil, paint brush or stylus and walk right in. I don’t pretend to be an expert in this area but what I can say is that over the many years of creating ideas that evolve into art for exhibition, print or screen, I have stumbled upon a few personal truisms that I can gladly share with you here. I guess you might call them key traits, habits or behavioural learnings but they have and still do.. open the door for me. Hopefully these observations will help many of you looking for a way out. As the way out is really the way in.. Looking is key. I mean really, really looking. It’s not easy, but I think with the advent of mobile photography, more and more people are beginning to recognise composition, colour and balance in their everyday life. Whether you are looking at the world via the lens of your camera or with your own eyes, start considering the viewpoint of your life and surroundings as art or opportunities for art. Try to pay attention to the smallest of details right through to something as vast as an expanse of open sky. Be appreciative and welcoming of the shade, the night and the darkness.. just as you are of light. It sounds simple but I want to encourage you to look and observe more. You won’t know it at the time, but much of what you see will unconsciously find its way into what you later create. So that’s the first key. Take the window seat every time and gaze. Watch the world whiz by, but absorb everything and anything. It really is. As much as you (and I) don’t want to hear it, we need to embrace the silence of being alone with ourselves more. Yes, the dreaded ‘no phone time’ for many of us. In short, less phone traps and distractions lead to more considered thought. So when you find yourself in a situation that you consider boring, use that time to advantage.. it’s free time to not waste on negativity or dead thinking. Turn to productive thoughts. Turn boredom into considered, creative thought.. start turning that key! Remember, it’s similar to coming home late from a party with friends.. it’s going to be hard to get that key in the door but you need to try. So don’t be afraid to experience boredom and use some of that staring into space time for some serious concentration and reflection. It's not the hours in the day, it's the days in the hours.. use your time productively! I stopped blaming a mythical inspirational figure for a lack of ideas a long time ago. Don’t wait for inspiration my friend, seek it out! Sure it can take time and a lot of work to arrive at that next ‘thing’ you want to get started on but remember, if you are collecting your thoughts and ideas along the way you will always have momentum via a library of inspiration. Become like a bower bird. Collect movies, music, docos, photos, text, tutorials, poetry.. all things that excite and stimulate your creative side. Collect unique words and phrases. An archive of creative thought or departure points that may generate images, concepts or further ideas for making original art images born from creative thought. At the same time, always reduce and simplify. Keep your own personal collection of images that interest you.. whether it’s from online images that inspire or even photos from your own camera roll. Kill your darlings as they say. Don’t become too attached to the images, artists and techniques of the past. The best art is still happening right now.. be alive and awake enough to seek out and enjoy the present as much as the past. Find mentors or like minded souls and learn from them. Hey I'll tell you the weirdest thing about what happens with me in regard to procrastination, creative block or how ever you want to describe those times when you can't find the right art ignition key. No joke. I had to look it up on the net but apparently it's a thing. There are others out there who share this strange phenomenon. Something about hot water being a catalyst. So why not end up in hot water at the beginning of a project rather than the end lol! Seriously though, that pesky procrastination happens to all of us at various times and for a variety of reasons. I think staying fit and focussed helps. Getting plenty of rest, having a break from art making, drinking lots of wine.. I mean water.. and starting or returning to your art with fresh eyes is always a good art starter. I should say at this point that art making is meant to also be fun so don't forget that. Trying to stay as positive as one can in this ever changing world and looking after yourself will go a long way in rejuvenating that right brain of yours. You need to get out of your own way. You are not somehow more special than anyone else because you create art. Thinking about your own self importance is a waste of time. Don’t try and make art that you think you should be doing, or that people expect of you. Be the best 'You' that you can. Trust your gut. Focus on what you really care about and follow those thoughts. As mentioned earlier, start to record thoughts, ideas and anecdotes. Allow happenstance and coincidence to creep into some of those collected thoughts and join the dots at a later stage to see where some of it may lead. Be relentlessly curious and start to trust in your instincts when it comes to your own creations and decision making. However, also be constructively critical of your own work and learn how to take similar criticism from others. Ultimately, don’t become too comfortable in your own skin. Remain humble and seek a path of constant renewal and learning with regard to your journey in art and life. Study traditional and contemporary artists, their art styles and different mediums. Return to them often, but always be on the look out for new inspirational heroes and techniques to be enthused about. Keep an open mind and soak up everything and anything. Find what it is that ‘works’ or is successful to you in an image. If you want to be successful in what you are doing, study those that are doing it. Be prepared to put the hours in but at your own life’s pace. Just like your heroes you can produce art that takes very little time and also work which takes years. Remember, the great artists give us something to aim at and miss. Remain inspired by works from the past but start to recognise the difference between being inspired by someone elses art as opposed to the imitation of it. This is important if you want to work towards a style of your own. You don't have to hold on to the same ways of thinking and practices in art. The freedom to choose new mediums and techniques is yours. You decide on what direction you want to go, and whether to develop a cohesive or less cohesive body of work. Allow yourself to make a few mistakes along the way and don't be too precious about every thing you begin. The key thing is that there are no real rules in art. You get to choose your own way to express yourself with any tool or method you want. That could be a scalpel, a brush, a roller, a piece of charcoal, a stylus, a camera, a mobile phone, some sculpting clay, paper collage, a digital tablet, a spray can, a stencil, your body.. you name it. Abandon conformity if you have to. Sticking strictly to one technique or medium might prevent you from growing and exploring new questions and journeys in your art making. My final key (and one I continually remind myself about) is to do that. Simply let go. The liberation in staying calm or less worried about what you want to create is the thing which will free up your imagination. Of course that is easier said than done, but you have got to try and get close to that point. The real key lies in preparation. At least that's what I have experienced. As I have allured to in the previous paragraphs, if you come to the canvas (or whatever art medium you choose) in not only the right intuitive mind set but with some sense of what it is you want to create.. you strengthen your odds and confidence of a much better result. Ok, I think I have rambled on enough here. I hope some of what I have mentioned in the post helps open a few new or current doors for you. I would love to hear from any of you working on either side of that door, so please comment below or hit me up via any of the social media links at the end of this post. Hey do you want to join my newsletter and stay up to date on news, free give-aways or discounts on my new prints? Sign up with your email address below..
New Limited Edition Hand Embellished Prints for Sale..
After many years of searching for an excellent printer company that could create the most lush, durable and outta this world gorgeous reproductions of my work I finally found a place that does exactly that. I’m over the moon therefore that I can now offer these very special unique and hand embellished prints. I have made a few of my most popular images available as limited edition prints which you can now purchase and be hung in your home! The reproductions are beautifully produced on acid free paper with fine, durable inks and look like an exact replica of the original drawing except with additional hand embellishments (watercolour, ink, pencil etc). Limited edition and hand embellished signed prints now available. Printed on fine art paper with archival pigmented inks. These inks not only provide vivid color, but are also designed to last hundreds of years. A selection of prints (size A3) are being hand embellished to be completely individual pieces, each different from the next. Are all of the O'Malley art images available as Embellished Prints? I have a select amount of images that are currently available as embellished prints, but if you have a particular image in mind, please email me at leithomalley@gmail.com and let me know which image you would like printed and I'll try and make that happen! Please allow up to 1-2 weeks of time to prepare to ship, as I am custom printing and hand-packaging these to get them to you in good shape and time. By default they will be shipped in strong/ sturdy cardboard tubes, if you would like your print flat packed please let me know, shipping costs may then be increased somewhat. Prints have a white border of approx 1-2 cm to allow for framing. Are O'Malley's Prints Limited Edition? Yes, some are. The designs that are limited edition are available at only 20 and will be signed and numbered. Thank you to those who are already ordering via email. I'm so grateful for your support! It's very rewarding when someone buys your original artwork and especially so when you know that it will go to the home of a real art enthusiast.. someone who has a shared appreciation of what it is you love to do albeit from an often more personal, subjective view point. Everyone enjoys a particular type of art for their own reasons right? Like the young lady in the painting, a chord is struck and you know you want that artwork in your life. On the part of the painter there's also a sense of strange sadness attached to any sale. You spend so many solitary hours in front of a work in progress, chipping away towards an unknown finish line. My recent painting 'Transcendence' a large oil on poly vinyl was harder to let go than most. That said, I eventually said my goodbyes a few days ago however and like most work that I pack and ship off - once they leave the studio I am already working towards the next picture and always.. I mean always.. thinking about how to improve on the previous. There's this conundrum I have. Advertising oneself online or otherwise requires that I present myself as a 'Visual Artist' but frankly I have never really been comfortable with the word 'artist'. I think that if I really believed such a thing I would never improve.. that I may as well stop now. That word sounds a bit pretentious to me. It's for others to wear, painters long gone that I have read about in books.. but nonetheless something to certainly aspire to. I am completely comfortable with other people describing themselves as such though. I just have so much to learn, so much to improve upon and work towards. Not just in technique but in all the other disciplines that form a human existence, an art experience, a creative life. Look, all this is probably another blog post but all I am trying to say is that I am in the pursuit of realising my own idea of what art is. I still don't understand or comprehend the compulsion to spend so much time on creating images on paper, canvas or screens. All I know is that there is wonderment within it, just as there was when I was ten years old. So where was I... yes, I sold another painting. All that was left was to pack and protect it for the customer (oh god I sound like a fricken salesman). I'm a bit of a stickler for detail so spent time making sure the work (framed and behind glass) was going to look great upon unpacking. I carried it to my kitchen table where I could move around it freely whilst wrapping it all up. 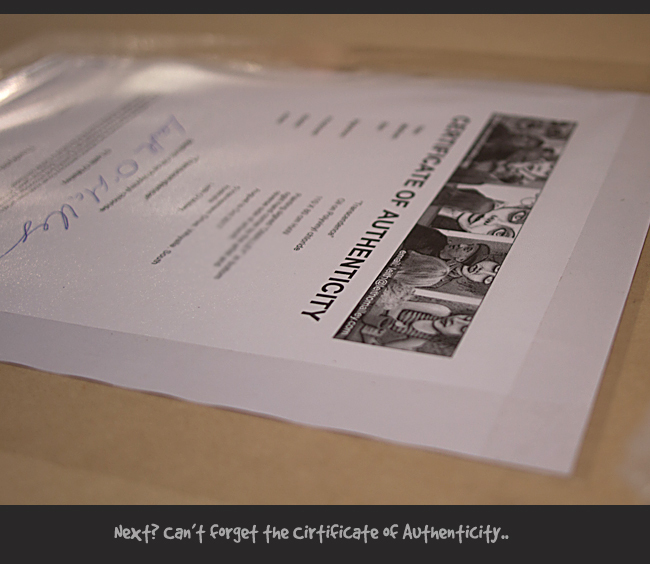 I almost always include a Certificate of Authenticity with artwork. I have it printed on an A4 sheet, hand signed and placed inside a plastic sleeve before finding a spot on the back of the work to tape it. 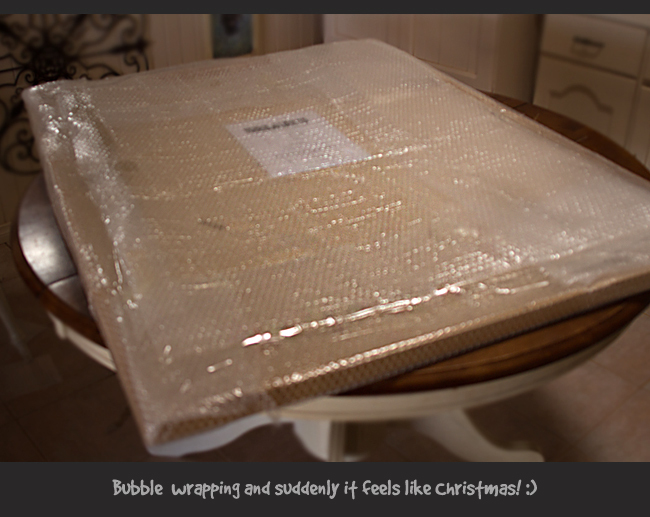 For artists, bubble wrap is the best thing since sliced bread right? Hang on.. no. That would be a toaster. A toaster is the best thing since sliced bread. The longer I type this blog out the hungrier I get. After bubble wrap (in this case) comes a nice protective covering of thin plastic. This painting doesn't have to travel too far and because I will be delivering it in person, I don't have to worry about wrapping the whole thing in cardboard. Well one must always add a final little trinket so to speak. 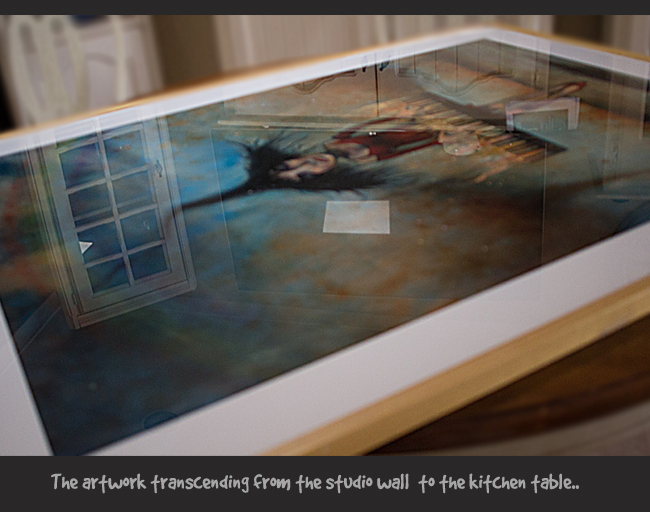 As a postscript, I delivered the painting to her new home and she looked very happy hanging on the wall. The owners were overjoyed and we had an interesting conversation about art whilst I was introduced to many other works in he and his wifes collection. I drove home a little while later, all the while thinking about what might eventuate next. I am pleased to announce my original art is now available at ARTSY thanks to the representation of my work at the site by the renowned Artist Duo Gillie & Marc. Gillie and Marc are critically-acclaimed contemporary artists (and husband-and-wife) who have spent the last three decades dazzling the world with their incredible, rule-bending, interactive artworks. During their art-career they have collaborated to create art as one, even working on the same canvas. This intrepid pair are best known for their iconic hybrid characters Dogman and Rabbitgirl who tell the autobiographical tale of two opposites coming together to become best friends and soulmates, proving everything is possible through love. Dogman and Rabbitgirl can be found in over 500 public collections and museums through 40 different countries across the globe including New York, London and Sydney. In 2016 the artists built the world’s biggest rhino sculpture for Sculpture by the Sea – the world’s largest outdoor sculpture exhibition in Sydney – which took out two prestigious People’s Choice Awards. They are now about to beat their own record by creating a 16-foot tall rhino sculpture that will be installed into Astor Place, the heart of New York City. Gillie and Marc are also the creators of The Paparazzi Dogs – currently in Greenwich Village, New York. Their larger than life Paparazzi Dogman and Paparazzi Rabbitgirl sculpture series will shortly be installed into 6th Avenue opposite the Rockefeller Centre. Artsy features the world’s leading galleries, museum collections, foundations, artist estates, art fairs, and benefit auctions, all in one place. Their growing database of 800,000 images of art, architecture, and design by 70,000 artists spans historical, modern, and contemporary works, and includes the largest online database of contemporary art. Organisers setting up last years Wacom event. Just Announced! The Next Level @ Auckland, Melbourne and Sydney! One of my most recent digital illustrations has been selected as a winner in 'The Next Level exhibition' which will showcase 30 winning artworks from a global digital art competition. Global? That's fab in my book! Digital technology company 'Wacom' and creative management agency 'Just Another Agency' have teamed up to present this one-of-a-kind exhibition. My selected work for The Next Level exhibitions. Prints are available at each showing. The exhibition along with a book publication will showcase winners of The 2017 Next Level competition alongside five elite artists, whose designs are created using various Wacom tools. The amazing Lauren Carney, Gemma Correll, Merda, David Milan, Rik Oostenbroek & Furry Little Peach will all have works on display. A toast to all the creatives at last years event. The New Zealand (Auckland) Exhibition runs September 21st-5th October 2017 at Silo Park, the Melbourne Exhibition runs October 31st-13th November 2017 at Besser Space and the Sydney Exhibition runs November 22nd-3rd December 2107 at M2 Gallery. Lots of good discussion and excited artisans at one of the 2016 Next Level exhibitions. It's so cool to be included in the first ever Wacom Artist Publication and Exhibition, featured with some of the world's best digital artists, and on top of that the people’s choice winner will win a Wacom Cintiq Pro 16 (RRP AUD$2199). It’s one thing to be asked to illustrate a musician you admire, but another to have the drawing so well received that it is showcased on the cover of a national music magazine. There's an Oz slang expression that comes to mind right now which is rarely used these days.. Bonza! Edited cover art for Rhythms Magazine. Rhythms Magazine has just released the 25 Year Anniversary edition of their Roots, Rhythm and Blues magazine and my illustration of American musician “Bonnie Raitt” is their chosen front cover art. So that’s something to talk about, right? So here goes..
Editor Catherine Britt a prolific and successful Australian recording artist in her own right, gave me the good news soon after I initially emailed her the final art preview. What a great surprise! It's actually the second time for me as far as cover art goes, with the magazine also publishing my rendition of Billy Brag and Joe Henry a few months ago. It's very humbling and complimentary at the same time. I love art and music.. especially the opportunity to meld both of these together in some way. A previous cover I produced for Rhythms Magazine - "Billy Bragg and Joe Henry"
Hey I got to see Bonnie play live in Australia once. It was some years ago now and as opening act for Bob Dylan.. and as much as I loved Dylan at the time, I was equally excited at the opportunity to hear Bonnie play. As for Dylan, well.. he seemed kind of preoccupied on the night, shuffling lyrics and rearranging songs to an almost unrecognisable state. It didn’t make it any less interesting mind you, and amazing to witness in person. I didn’t care. There was something about being in the same space as Bob Dylan that night.. breathing the same air as him. It tasted good, sounded good. He's an enigma, and still puts the eclectic in electric as far as I'm concerned. Anyway, I shared the experience with my brother Shaun and as I recall wide, amber smiles were the order of the night. Bonnie sang some beautiful ballads behind keyboard as well as shredding on her trademark electric slide guitar throughout the evening to a rapt audience. Suffice to say Bob Dylan had a hard act to follow after Bonnie left the stage. She really was fantastic that evening in so many ways and I’ve continued to follow her music. Come to think of it, I've even blown a little blues harp along to her tunes in one or two of the bands I’ve messed about in over the years. Music is art too right? In fact, for this drawing I referenced my own Shure 55SH microphone (which the small bird is sitting on) as one of the budding flowers in the foreground amongst the flowering Shure 58s. Like many good blues recordings, Bonnie’s songs carry a little darkness along with the light so I thought a few ravens or crows drawn flying about in the distance might add a little subliminal colour (blues) to the piece. As for the names etched into her guitar, from my research they are several of Bonnie’s inspirations including BB King, Sleepy John Estates, Chaka Khan. Little Feet.. and I also included her Dads name (John Raitt) on the head stock. Like all illustration commissions I like to watch as many videos, listen to as many interviews and read as much as I can about the musician before picking up a pencil or piece of charcoal and where music is concerned, these things feel so much more like a labour of love and I hope that some of that passion is evident in what I do. So there you have it, a short, enthused ramble about this drawing and a little trip down memory lane for myself in a way. The magazine is the March/April 2017 edition and is likely to be in most good Australian news agencies now or very soon. Bonnie Raitts new album 'Dig in Deep' is also out now and I believe an Australian tour to be on the cards. Fingers crossed she comes to South Oz! My two Bobs worth.. A recent portrait of "the man in the long black coat". Time marches, on and in serendipitous fashion I recently welcomed the opportunity to illustrate Ben Harper via a commission for the Australian music magazine “Rhythms”. The illustration started out as a mixed media combination of photographs, traditional media, hand drawn plus painted elements, digital collage and some big city chalk. She wears tall boots. U-Huh. A young woman with the ability to shoot words, rhythm and rhyme out like an AK47 is destined for success. It also became a sort of old school approach in a way, with the combination of an almost vintage form of digital media with a portrait of a popular digital character from days gone by or the beginnings of popular electronic gaming.